DevOps, the successful combination of development and operations to improve the speed of development, while reducing chances of error. This new practice collaboratesthe software developers with other IT professionals, thus automating the software delivery as well as infrastructure changes, ensuring speed of development and deployment. This concept takes charge of development and operations using agile methodology. With DevOps you are capable of launching your app quickly and getting a competitive edge. Let’s see how this new practice reduces turnaround time for your mobile app. Speed is the key in today’s competitive business environment. Whether it is an enterprise app or a consumer app, DevOps’ agile methodology helps in reducing the time from conceptualization to actual delivery. Key aspects of development have been automated in this ecosystem, thus ensuring fewer mistakes, quicker deployment and easy integration of the various systems. With this, enterprises can adopt either proactive or reactive approach, whichever suits their needs. In the traditional environment, the design, development and testing teams worked in isolated environment, which caused unavoidable delay in the process of app development. DevOps has removed this barrier by automating communication between the different members of the app development team, thus offering improved time to develop the apps, and quicker launch of the app. Mobile market is fragmented and every business has to develop apps for minimum two platforms at least to be successful with their campaign. Cross-Platform app development can often give nervous moments to the developers, considering the thousands of devices especially in the Android ecosystem. DevOps strategy eases cross-platform development and helps create native like experience in the apps thus improving user experience. Mobile app testing is one of the most important stages in the development process. It is also one of the biggest bottlenecks as traditional developers would manually verify the test scripts. 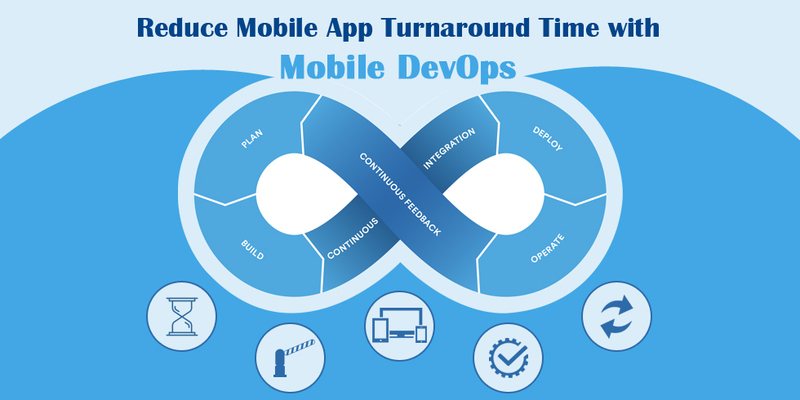 Using Mobile DevOps the entire testing process is automated, thus saving your precious time. In fact, developers can adopt the testing-as-a-service strategy that allows them to test the entire app or selected features as and when required. For a business, it is important to keep updating the app to meet the changing needs of your customer, and to keep up with the frequent releases of the different OS. To avoid any discrepancies or impending delays, you need to evolve with this practice. It is ideal for apps that require to be constantly upgraded, syncing it to the needs of the market.